We recently attended the IREM (Institute of Real Estate Management) Premier Awards at The Drake in Chicago, IL. 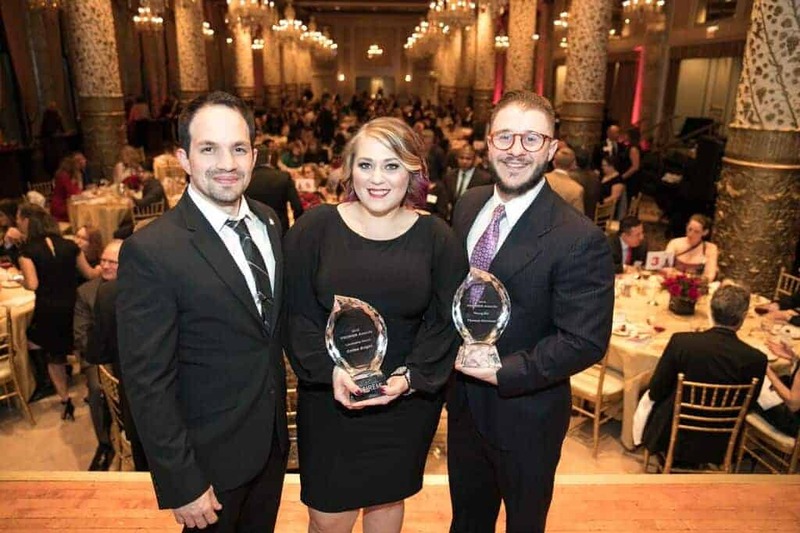 We are very proud to announce that two of our very own Hillcrest employees had the distinct honor of receiving IREM’s Chicagoland property management awards. We would like to extend our sincerest congratulations to Ms. Celina M. Bright and Mr. Thomas J. Purrazzo! Celina received the 2018 Leadership Award for her outstanding leadership within the industry and at Hillcrest. Over her five-year tenure with Hillcrest, she has become an active volunteer on multiple committees for IREM, and volunteers her time for CAI-IL (Community Associations Institute) on the Marketing committee. Celina has helped to create, implement, and facilitate the RFP (Request for Proposal) process at Hillcrest. She also oversees the Hillcrest’s Vendor Select Program. In 2016, Celina started the #HillcrestSupports campaign which raises money and awareness for different charities and the Hillcrest community. We are happy to say that during the 2017 year the campaign helped to raise over $8,000 from contributions by our own employees, clients, and vendors within the industry thanks to Celina’s initiative. • Before working at Hillcrest, she worked with children who have Autism. • In her free time, she likes to paint, draw, and work on her hand lettering (stop by her office and see some of her work- it’s neat!). • She really enjoys a good selfie to get the day going. With only 2 ½ years in the industry, Tom received the 2018 Rising Star Award for his great commitment to becoming an industry leader in under five years. He started at Hillcrest as a mentee in our Mentor Program, and soon graduated to a Certified Property Manager. He now handles a portfolio of Associations. Tom is also an active volunteer and is currently on committees for both MCD Media and IREM. He has donated his and his band’s time to help raise funds for IREM’s Silent Auction, where all proceeds went directly to Camp I Am Me. Tom attends ongoing weekly education from industry partners. He is also currently continuing his education to pursue the CPM designation. • Tom is one part of the band “Matt Zach and Tom,” that frequently plays in Orland Park, Worth, and other south suburbs. • In his free time, he works to perfect his home brews and remodel his house. • He loves his female cat named Steve. We are very proud to have Celina and Tom as part of the Hillcrest family. We thank them for all of their hard work and dedication to both Hillcrest and the Chicagoland Property Management industry.